Eighty percent of working households have less that one year’s worth of their annual income saved. Even scarier is the fact that more than 90% of those in the 55-64 age group have less than four times their annual income saved as they fast approach their retirement years. 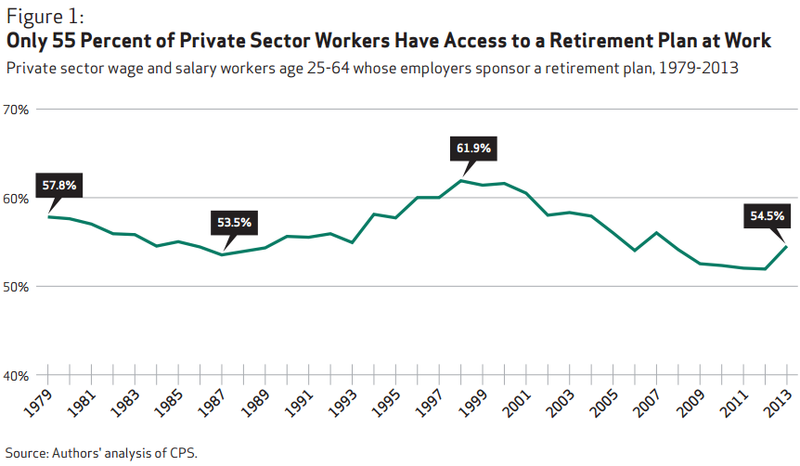 This is disheartening to see, which is why I think the government should make the Thrift Savings Plan, which is the retirement plan for government workers, available to all workers. The costs are too high for many small businesses to offer a retirement plan for their employees so those people are at a huge disadvantage. Regardless of the investment options available in a workplace retirement plan, the best thing about them is that they’re easy to participate in. The contributions are taken directly from your paycheck before you even have the chance to spend that money. And the best investment anyone can make each year is to take a company match, which constitutes a 100% return on your money (assuming your company offers a match — about 60% of 401k plans do). Almost 40% of individuals in the United States either could not or probably could not come up with even $2000 if an unexpected need arose. In 2012, almost 60% of individuals in the United States did not have three months of emergency funds that they could access to cover an emergency. The majority of U.S. households do not have the buffer they need to help them survive through such shocks. More than 20% of individuals “strongly agree” that they have too much debt. If we add people who at least somewhat agree with the statement, then over 40% of households believe they have too much debt. 35% of individuals both have too much debt and do not have three months of reserve funds in case of an emergency. I find the financial markets and portfolio management to be fascinating topics to cover. Because of the psychology involved and seemingly endless changes to market dynamics, there is always going to be something interesting to discuss, learn or think about. But the hard truth is the majority of Americans need to focus, first and foremost, on getting their personal finances in order — getting out of credit card debt, creating a spending plan, saving enough for an emergency fund, building up a good credit score, etc. Only then can people actually start to save money for the future. For 9 out of 10 people, managing their personal finances is going to be far more important than managing their portfolio or optimizing an investment stratgy. It Financial Literacy a Lost Cause? It’s funny how segregated the two issues are in the discourse. In fact, the whole reason I started writing my own blog was that this made no sense to me. A study and application of investing capital allocation (whether through value investing or other methods) in one’s life should obviously be paired with a study and application of methods of spending allocation (whether radical frugality, which as I’ve said is my own approach), or some other methodology that makes sense. Sadly, I think saving intangible assets is contrary to human nature. It’s especially hard to teach in this ZIRP environment. Unfortunately, millennials not only have the bad lessons of the last decades in the stock market that it must inevitably crash and boom, but also that you don’t get anywhere by saving money. You can’t have a comprehensive financial plan without considering your entire financial picture. Having everything else in order before you’re able to take risk in the markets is key. I agree with the general notion of this article that for many people in the middle class, even in the lower middle class and upper lower class, getting their financial lives in order is far more important than worrying about the proper allocation to emerging markets or many of the other concerns that animate the financial services industry. However, I have to say that as an advisor to middle class and even lower middle class people (I have been working with these people for 20 years now), I am not nearly as fearful for their future as many industry commentators, institutes, etc.. appear to be. When I hear of a statistic saying that you need to have 22 times your annual salary saved I wonder how is it possible that they have arrived at this number? What is that based upon? If someone is making $40,000 a year that would mean that they would need to have almost $900,000. That would be wonderful if they do, but hardly any of them will. More importantly, why would they need that much? In the real world, the only driver is what people spend – their budget. That is it. What I have experienced is that almost all of my clients have learned to live within a very modest budget by the time they get to their late 40’s or mid 50’s. For the most part, they are living within their means. Not all of them, but most of them. In fact, for many of the people that I do retirement plans for, their social security will get them very close to meeting their obligations. I can honestly say that many of my clients are doing ok, not great, but ok, with their social security and some very minor additional income. Sure, they may not be able to travel around the world or spend 3 months in Sun Valley or whatever “better off” retirees do, but most of the people that I work with don’t want to do all of that stuff anyway. They generally want to spend some time with Family and have a hobby or two they can pursue. Of course, there are legitimate concerns about where we are going with Social Security and, just as importantly, Medicare, but for many people these programs will provide the financial support they need. Of course, they will be vulnerable to a long term care event – there is no getting around that. Anyway, just my 2 cents worth on this issue. I am willing to admit that I could be off base on this, but I have worked with well over 1000 people on this over the years (I decided to count this up late last year). That is a lot of planning and feedback and I don’t believe that this is a macro issue. That number is based on 22x what you need to spend (not too different than the 4% rule which would be 20x). And you’re right that you have to take into account all forms of fixed income, including SS and pensions, when figuring out how much of your remaining spending has to come from savings. I agree that how much you spend and what your lifestyle inflation is should be the biggest factor when making these plans. And there is a lot of hyperbole around the “retirement crisis.” It’s not like there are bread lines for retirees. Many just have to adjust their standard of living and like you said, not have too many vacation plans. It’s all about what’s going to make you happy. Ben, thanks for sharing this report. I’ve been thinking and writing a lot myself about this idea too. All the planning and strategy in the world won’t make a difference if you don’t have any money to save and invest. But where to find that money? Yes, cutting credit card debt is important and helpful but I wonder if it will be enough. I wrote about a recent Blackrock report here http://wp.me/pgRSw-kt. (Apologies in advance for the cross-promotional post) and a stat that showed how Americans spend their household income compared with the rest of the world. Most U.S. household income goes toward essential expenses and the smallest % is for discretionary spending. The Blackrock report doesn’t go into detail on what counts as essential spending, but I would safely assume food, transportation and especially housing is in there. So I wonder what share of this essential expense spending is housing. Are most of us living in too-big, too-expensive houses, and are the prices too-inflated? I think the same NIRS report provides a clue to this, in the table comparing retirement account balance to income and net worth to income. 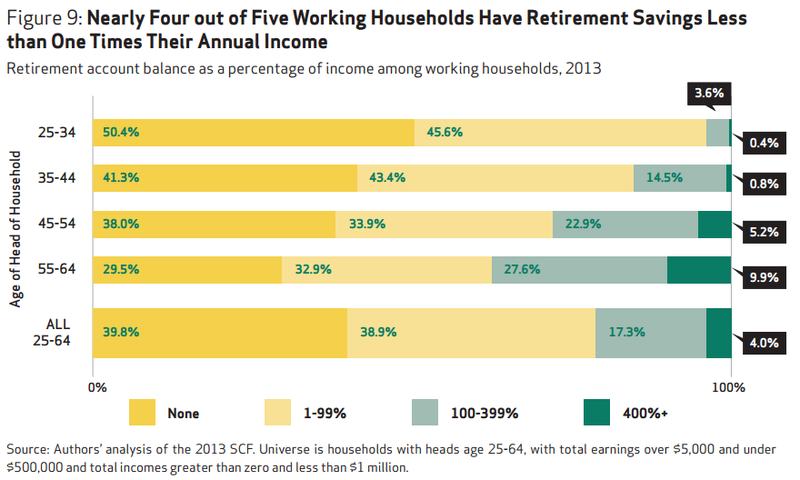 Total net worth is sky high compared to retirement account balance, especially in the 55-64 age cohort. That makes me think much of this net worth is in their house, not their retirement account. A shift there, it would seem, would help fix their retirement outlook dramatically. Good point. Obviously there is always going to be a subset of the population that won’t be able to save. But for many it comes down to priorities. New cars and houses are probably the two biggest problems in my mind. I also think where you live and your cost of living have a lot to do with how much you can save as well. I remember that one. Sobering is the perfect temr for this but I’m still not sure what the solution is.